A candle made of purest soy wax and natural essential oils and fragrances. 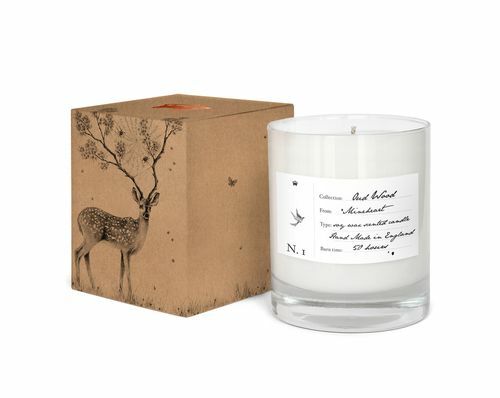 The packaging features a beautifully surreal drawing of a deer with branched antlers by illustrator Courtney Brims. The scent is a majestic blend of rich Ambers, Patchouli, Jasmine and Oud mellowed in a subtle Cedarwood which is ignited with flecks of pure Vanilla. Designed by Mineheart with illustrations by Courtney Brims. Due to the nature of pure soy wax with no additives, you may notice the appearance of some slight imperfections which are caused by wax shrinkage, or colour changing on the surface of your candle. This will not affect the burn or scent throw.